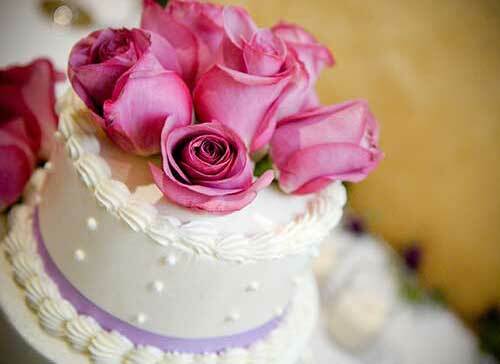 Our beautiful wedding cakes are a sweet treat for your Las Vegas Wedding. Whether you're having a large wedding reception or a small celebration, our wedding planners can book the perfect wedding cake to celebrate! Don't miss out on one of the most delicious wedding traditions. Our delectable desserts come in a variety of sizes, flavors and types. Couples can arrange to have their dessert order to take straight from the Chapel, or have it delivered to their reception venue. Perfect for an intimate reception to go! Our classic wedding cake is paired with all the fixings for romantic celebration for two. The dessert package includes a 6" Splendid Wedding Cake with sparkling cider and glasses, plastic plates and forks, keepsake bottle opener and silk rose petals. Take your wedding cake to go! This gorgeous wedding cake is paired with everything needed to enjoy back at the hotel. The cake package for two includes a 6" Divine Wedding Cake with sparkling cider and glasses, plastic plates and forks, keepsake bottle opener and silk rose petals. Enhance your wedding memory by indulging in a dozen chocolate covered strawberries drizzled with dark and white chocolate. This must be ordered at least (3) Days in advance.